Zimmer Biomet: Will Q4 be the Turning Point? Zimmer Biomet’s (NYSE: ZBH) US sales have declined every quarter since Q4 2016. After stating their expectations to make significant progress on remediating their supply issues during the first two quarters of 2017, Zimmer management was unable to meet those expectations and delayed their resolution timeline numerous times. The company missed consensus top-line estimates again in Q3 2017, with management stating that they still haven’t made the anticipated remediation progress. This leads to an important question: Could investors have known that Zimmer Biomet would likely miss on top-line estimates prior to the Q3 release? 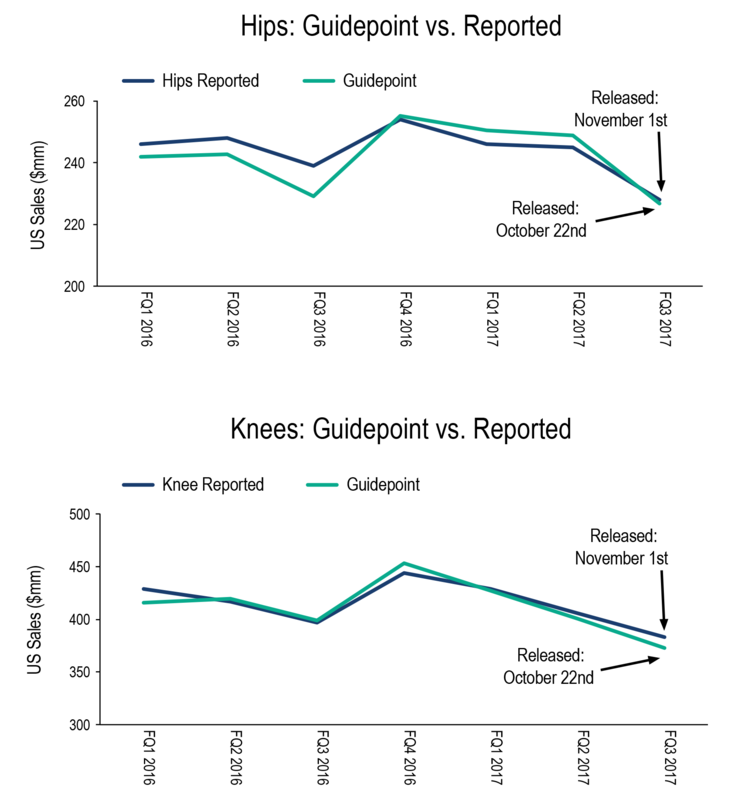 Guidepoint’s Qsight analysis of proprietary US hospital purchasing data, tracking monthly purchasing of over 1,500 facilities in near real-time, was able to indicate continued erosion in hospital spend on Zimmer Biomet hips and knees in 2017. Furthermore, the data shows that this trend largely continued each month throughout the third quarter. Guidepoint’s data captured how supply issues affected sales as early as Q4 2016, and hips and knees purchasing data showed a decline in quarterly spend in subsequent quarters. Specifically, Q3 2017 year-over-year, Guidepoint data showed that knee spend was -6.1% vs. -3.5% reported sales, and hip spend was -1.7% vs. -4.6% reported sales. On a quarter-over-quarter basis, purchasing showed that knee spend was -8.7% vs. -5.7% reported sales, and hip spend was -8.2% vs. -6.9% reported sales. Guidepoint purchasing data captured the initial, and continued, decline in sales. Looking forward, Guidepoint’s monthly data will provide information on spending trends for Q4 2017 in near real-time before Zimmer reports results. Because of this, investors may gain greater insights into Zimmer’s top-line performance with each passing month. Zimmer’s Q4 2017 guidance is a 2-3% YoY growth in the knees and hips market which should lead to increased revenue and substantial progress with regard to resolving their supply issues. Many analysts believe that Zimmer will have a turnaround, but it’s just a matter of when. Will Q4 2017 be the beginning of that turnaround? Or will it take another three quarters to see progress? Guidepoint Qsight Healthcare provides a multi-dimensional, quantitative view that tracks company performance in the healthcare industry. By leveraging the power of proprietary industry data along with Guidepoint TRACKER’s primary data, Guidepoint can provide a level of insight into market dynamics not found anywhere else. With additional data added over time, this innovative new approach provides high-valued, coverage-driven insights for investment clients.